You can obtain a copy of your official transcript from Sacred Heart University through the Registrar’s Office's official transcript request ordering system. The Office of Career Development strives to facilitate the process of career choice by helping students and alumni focus on a personal sense of meaning and career direction in relation to their distinctive gifts, goals, and vision for living. To find out how the Office of Career Development can assist you in your job search, click here. The Chapel of the Holy Spirit, located adjacent to the Administrative building, is the primary worship space for the University. The chapel was dedicated in 2009 and is ‌both literally and figuratively at the center of both the University campus and its community of learners. Mass is held during the academic year (when classes are in session) Monday - Thursday at 12:30pm, and on Sundays at 12:30 pm & 7:00 pm. To request a Mass be said in Remembrance or, for information on alumni weddings at the Chapel, please contact Campus Ministry at 203-371-7840. Please check the Campus Ministry website for Holy Days of obligation and special Mass schedules. Alumni discounts are available for some of the performances. Please view the Edgerton Center for the Performing Arts website for specific alumni discounted rates by show. All Sacred Heart University alumni have borrowing privileges and can access the Ryan-Matura library during it's normal business hours. Have you had a book published? Donate a copy of your book to the Alumni Collection! The collection is displayed on the first level of the library, adjacent to the faculty collection. Need a new SHU Sweatshirt? Want to purchase an official Sacred Heart University frame for your diploma? Show your pride! Unable to attend a game? Listen live to Pioneer Athletics! 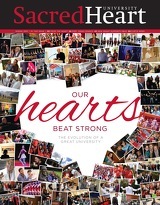 Stay connected to the SHU community by reading the latest edition of the Sacred Heart Magazine! Access the latest edition here. Established in 1983, the Spectrum is one of two print publications on the Sacred Heart University campus. The Spectrum is a weekly newspaper publication. Check out what's happening on campus, in the classroom and view clips from recent events on our YouTube Channel.